If you want a fun and easy way to make Valentine's Day breakfast, check out these fun cut out heart pancakes made with packaged pancake mix and a little red food coloring. All you need is a heart shaped cookie cutter. Of course, my pancakes never come out perfectly round, so I need a tutorial for that too! 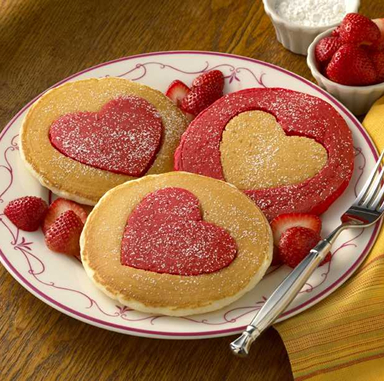 You can check out these cut out heart pancakes over at the Aunt Jemima website. If eggs are more your thing, check out the Valentine's egg breakfast ideas in my archives.